I suffered an avulsion fracture and midfoot sprain. I was wearing wedge shoes and had a little fall. I had been going thru different orthotics and training hard for IMTX, so I'm pretty sure this was just the last straw. See previous posts (A Hard Pill to Swallow and Not how I wanted to start my IMTX Training) for more of the story. 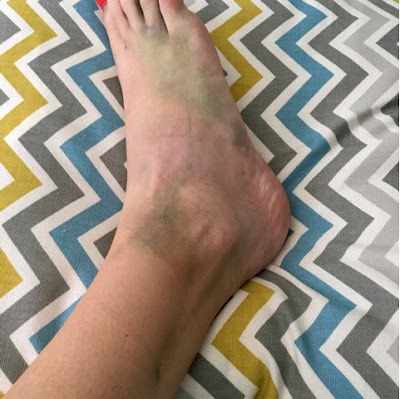 Two weeks later and there was still discoloration and quite a bit of swelling and pain. It's too challenging to sleep in the heavy boot, so I was wrapping it in an ace bandage but this wasn't offering the support I needed and I was having difficulty sleeping. At three weeks swelling has significantly decreased. By the end of the day my foot sees more swelling, but what an improvement! Bruising has also improved! I am surprised by how much better it looks, but I am equally surprised by how awful it still looks 3 weeks later! And unfortunately it still hurts more than I had hoped it would by this point. But I will gladly take any improvement I can get at this point! So very grateful for the Bioskin AFTER DC Ankle Brace! 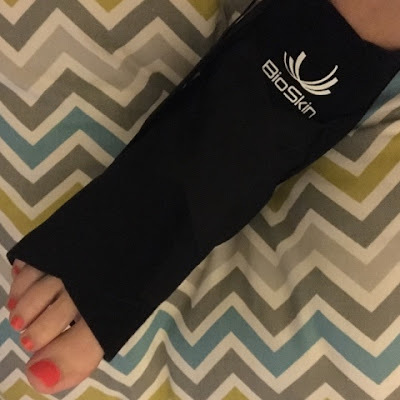 This brace is so comfortable and supportive that I am in less pain and sleeping so much better! 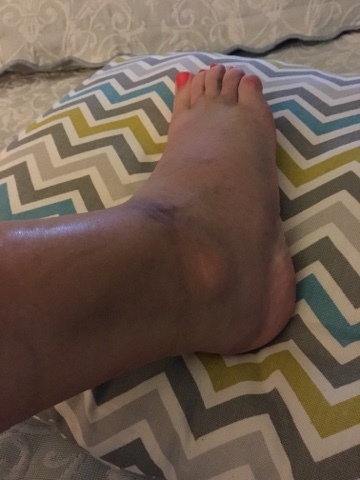 I have been continuing with RICE (Rest, Ice, Compression, Elevation), anti inflammatories, Epsom Salt soaks, essential oils, and lots and lots of prayers! My next appointment with the orthopedist is the 21st. I am hoping to see some real improvement between now and then so I can at least get back in the pool and maybe on the stationary bike! These last couple days are getting more and more challenging. Not being able to drive is a huge inconvenience and my family is definitely feeling it! And I am going stir crazy!! I just keep reminding myself this too shall pass! And in the mean time I am strength training like a boss!!! I am so impressed with your positivity and tenacity! I know you are so so bummed but you are undoubtedly IRON Jill!! After getting well, you should start using best running shoes for flat feet. It will be comfortable for you and will be good for your feet as well. It`s nice recovery after injury. There are many medicines present in market which you can use for ankle treatment. One of the most effective medicine is iaha for ankle treatment which you can use for more effective result. For more info visit Dr.korman laboratories.